Clubs across USTA Eastern will hold play events in celebration of World Tennis Day, a nationwide effort to get kids excited and active in tennis. During the next couple months, the USTA will invite families and kids of all ages and skill levels to try tennis at local events and facilities across the country—encouraging kids to get on the court and in the game. Studies have shown that an early, positive experience in sports is vital to combatting physical inactivity and creating a lifelong commitment to an active lifestyle. More than a thousand facilities will host USTA Tennis Play Events this March, each showcasing how fun and easy it now is for families to get into the sport. These events will allow parents to sign up their children for spring and summer tennis programs. Savage’s club, which is located at 2902 US Route 9W, will hold a USTA Tennis Play Event on Saturday, March 8 from 5 - 8pm. USTA Tennis Play Events are a fantastic way to inspire children to get into the game, according to Akiko Tohmatsu, the 10 and Under Tennis Program Coordinator for the Eastern Athletic Club in Blue Point. “In my view, they give another opportunity for kids to play the sport,” she said. Tohmatsu, whose club recently held a Play Event and plans to hold others in the future, discussed the importance of teaching 10 and Under Tennis at USTA Tennis Play Events. The kids enjoy the many activities offered, she said, including the chance to play matches, improve technique through drills, and take part in round-robin tournaments. World Tennis Day on March 3 serves as a kick-off to the Play Events. It is a celebration of tennis around the world that includes professional tennis matches in New York City, Hong Kong and London. The World Tennis Day celebration in New York’s Madison Square Garden will feature Novak Djokovic squaring off against Andy Murray, and Bob and Mike Bryan taking on John and Patrick McEnroe. A number of other March Play Events have also been planned in Eastern. Below are the dates, times, locations and contact information to register. 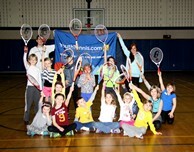 To learn more about USTA Tennis Play Events, please visit www.youthtennis.com.